Last I checked, whenever something ends in -ology, it means the study of something. That is, unless someone has redefined the word. There is quite a bit of redefining going on nowadays. So, if you are going to have a study of something, it stands to reason that there should be something to study. Cosmology is not science, and in a very similar way, that thing called astrobiology is not science, either. 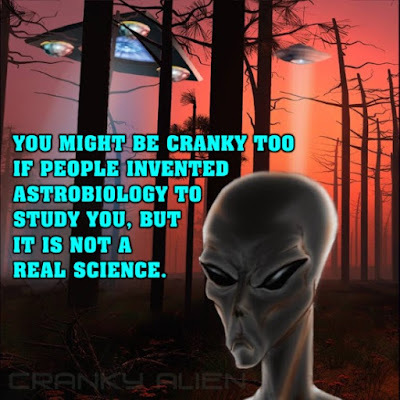 There are no alien machines to study, nor are there aliens. I'll allow that scientists examine certain chemicals way out there thataway that may be conducive to life, but there is no biology happening. Just speculation and guesswork based on Big Bang assumptions and evolutionary presuppositions. If you study on it a spell, you'll see that they assume that since life evolved here, it must have evolved out there. See how that is supposed to work? They use the scientific principle of Making Things Up™, and then get paid for...doing nothing, actually. Secularists deny what is obvious and what has been revealed in God's Word: our universe, and life itself, is the product of the Creator. Worse for their worldview, he did this recently. Number of worlds beyond Earth where life has been discovered: zero. Number of optimistic articles about life in outer space: hundreds per year. 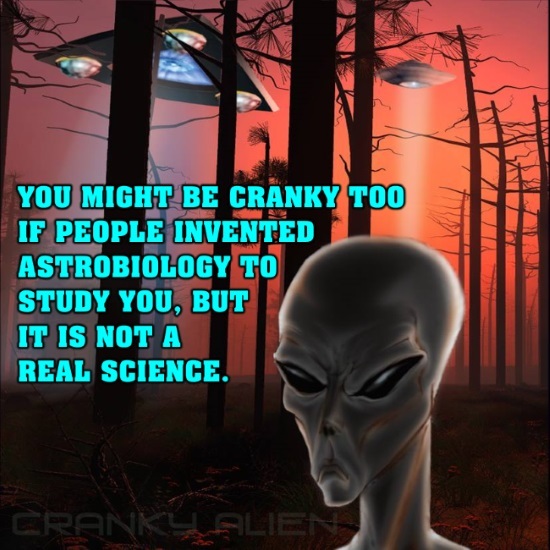 What happens when you take “bio” out of the fake science called Astrobiology? It becomes a pseudoscience. Since there is no “bio” yet found beyond earth, except in the imaginations of storytellers who believe in evolution, maybe that is a more accurate label. Here are some samples of fact-free, evidence-free stories circulating on science news sites. To read the samples, click on "Astrobiology Still Has No Biology".